A storm over the Del Sal Mountains viewed from Arches NP in 1997. Light. . .without light, there is not a photograph. With light, there is a photograph. Using light within you composition can create a breath taking photographic image. Sometimes, it’s simply luck. This photo was taken from Arches NP on one of the roads. 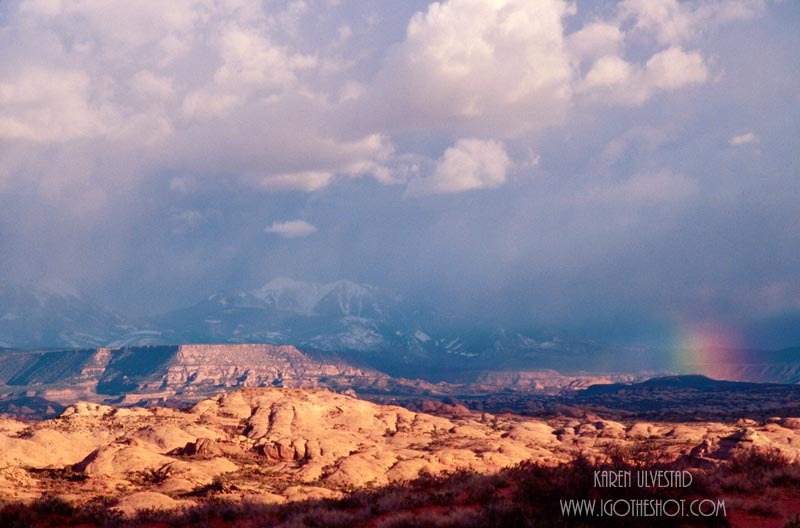 It was late afternoon, and the storm over the mountains with the rainbow added to the composition of the image. It’s one of my all time favorite images, and the first time published. Sometimes, it takes research, patience and timing. I didn’t know that the storm was going to happen. It was truly a serendipitous moment. It’s also one that not everyone would see. My travel companions on this trip didn’t want to stop, and one of them was a photographer. I think it comes down to being aware of the surroundings, and seeing/predicting what will happen next.